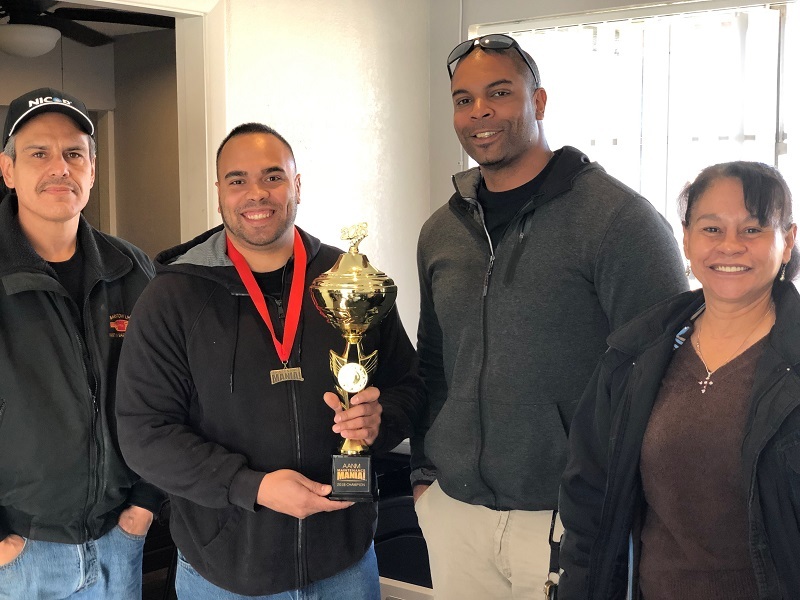 ALBUQUERQUE, NM / November 30, 2018 – The Apartment Association of New Mexico (AANM) is pleased to announce that Matthew Ortiz of Osuna Apartments, managed by Sovereign Management Corporation won the AANM Maintenance Mania® competition. Matthew’s earned first place with the fastest overall time in the 13 year history of the competition in New Mexico. Additionally, Matthew took home medals in several of the individual events. The competition—presented by NAA and presenting sponsor HD Supply, a leading distributor of maintenance and renovation products—consists of eight maintenance-focused challenges. This season’s competitors will test their maintenance skills and knowledge of the industry as they compete locally to earn a spot at the 2019 Maintenance Mania® National Championship in June in Denver. Racing against the clock, these highly skilled maintenance professionals will compete against each other to see who is the fastest at water heater installation, key control, faucet installation, icemaker installation, fire & carbon monoxide safety installation, toilet conversion, and ceiling fan installation. The finale of the event concludes with a race car competition, where the competitors build a model car using at least one maintenance product or part and race it down a pinewood derby-style track. The 2018-2019 Maintenance Mania® season kicked off in September and will continue through April 2019, with an estimated 60 local events scheduled across the country. For more information on the AANM event, visit www.aanmmaintenancemania.com. Visit AANM online at www.aanm.org. Maintenance Mania® is a national competition where apartment maintenance technicians are able to compete against each other in various skill-based games focused on frequent maintenance issues. Maintenance Mania is offered by the National Apartment Association, a leading advocate for quality rental housing, and presenting sponsor HD Supply Facilities Maintenance, a leading supplier of maintenance, repair and operations (MRO) products to the multifamily industry. Nearly 70 qualifying events are hosted nationwide by regional NAA affiliates, providing 20 top technicians the opportunity to compete at the National Championship to be held in June in Denver. The Apartment Association of New Mexico is a private non-profit trade organization dedicated to providing a common foundation for rental housing industry professionals and the various businesses that service the industry. AANM currently has approximately 800 primary and associate members, representing more than 61,000 units across the state. AANM promotes professionalism, education, career development and pro-active legislative efforts to benefit owners, investors, residents and association members. Through its affiliation with the National Apartment Association, AANM participates in the Joint Legislative Program of NAA and the National Multifamily Housing Council. NAA is a federation of more than 170 state and local affiliates comprised of multifamily housing members representing more than 9 million apartment homes throughout the United States and Canada.